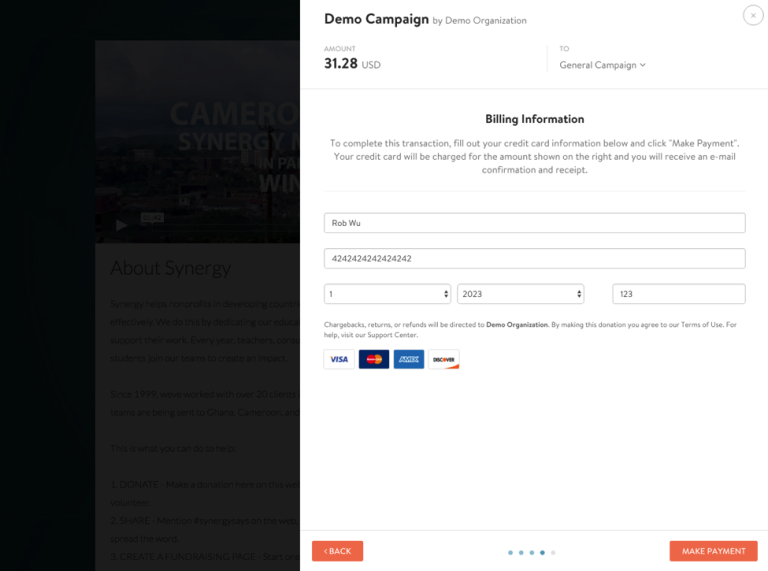 With every campaign on CauseVox, you're given the opportunity to pick between PayPal or Stripe for donation processing. As with any decision, it's always good to weigh the pros and cons of the vendors to help you make the best decision on behalf of your nonprofit organization. We've compiled a list of categories that addresses the strengths and weaknesses of both, which will help you assess which is best for you. 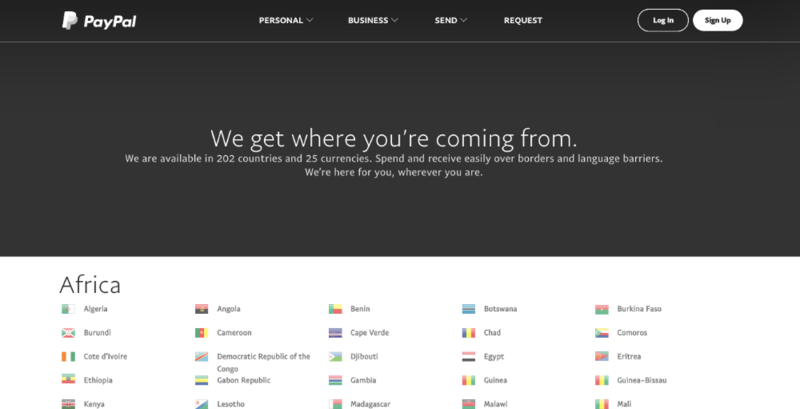 While PayPal and Stripe can both accept payments via any major credit card from anywhere around the world, there is a difference in the countries in which accounts can be set up. PayPal is available in 202 countries with 25 currencies, making them the leading choice for NGOs and social good projects in many countries around the world. In contrast, Stripe is still new to the game, and is officially available in Australia, Canada, Denmark, Finland, France, Ireland, Norway, Sweden, the United Kingdom, and the United States, with accounts available in beta in 15 other countries, each with corresponding currencies. While PayPal does offer greater availability, just because you can set up an account in a country doesn't necessarily mean PayPal can always deliver the desired results. Organizations operating in countries in Africa, Latin America, South America, and Asia, can experience some restrictions, meaning they may be only able to send funds, only receive funds from within their country, or they may be able to receive funds into their bank account but not be able to transfer it into their bank account. If you're looking into creating a fundraising site in a country in Africa, Latin America, South America, or Asia, please reach out to PayPal to confirm that they'll be able to transfer funds into your bank account receive them. If they aren't able to transfer funds, if you have any partners, family, or other contacts in other countries that have fully functioning PayPal access, then you may want to reach out to see if they'd consider receiving funds and transferring them into your account. For organizations that are looking to receive multiple currencies, it should be noted that both Stripe and PayPal only allow you to set one currency. However, funds can be received from just about anywhere in the world via credit card. For transactions from one currency to another, PayPal charges an additional 2.5% fee, while Stripe charges an additional 2% fee. Therefore, if you plan on receiving a large portion of funds in another currency, you may want to choose Stripe. Alternatively, you could choose to set up multiple accounts in Stripe or Paypal set to different currencies and create separate campaigns based on currency. While PayPal and Stripe are integrated with CauseVox so that they are both viable options, there are significant differences in how they work for the donor and also have different advantages. 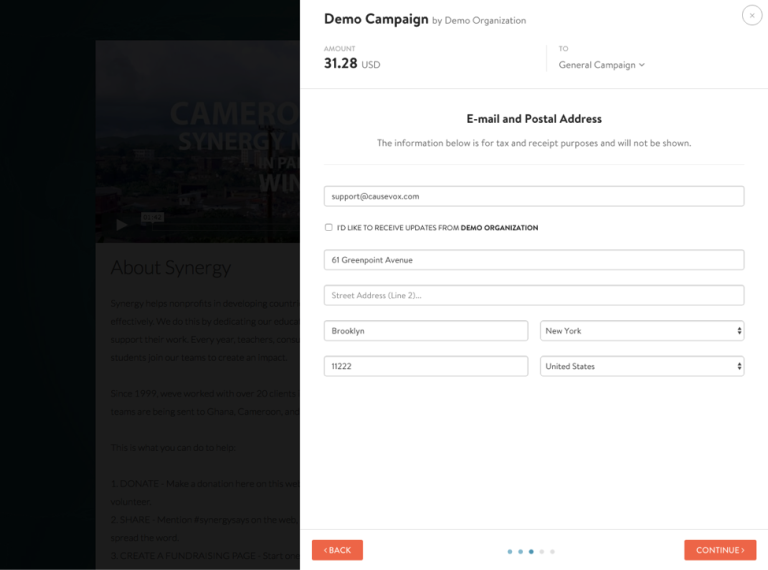 First, when donors give on a campaign site using PayPal, after they reach the third step and enter in their email and postal address they're redirected to PayPal to complete their donation. Once in PayPal, donors will have to reenter some of the information entered on the CauseVox form like name, postal address, and email address. However, donors have the option of donating either through their PayPal account (no credit card required) or by their credit or debit card. Donors never need a PayPal account to donate. Alternatively, Stripe's integration with CauseVox offers the advantage of making the donation process seamless. Donors never leave your campaign to complete their donation. With Stripe's seamless processing of funds, donor often are less confused about how to complete their donation, but they also loose the opportunity to pay via their PayPal account. The ability to set up recurring donations. This way, donors can choose to make their donation a monthly donation, giving your organization long-term income instead of just one-time donations. 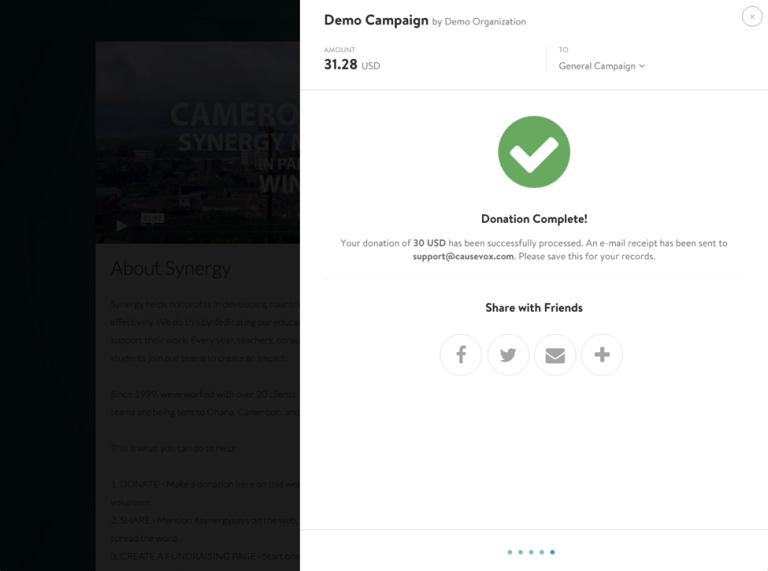 The option to share your campaign on social media once the donation is completed. 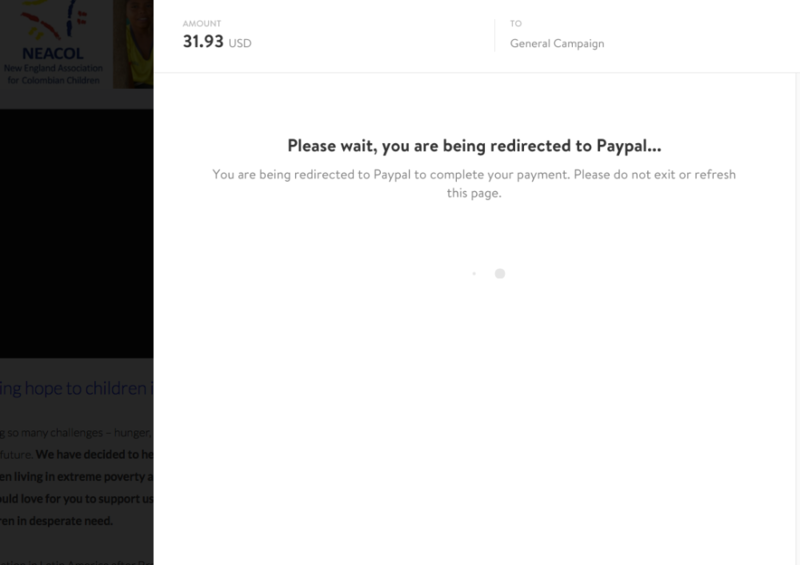 While with PayPal donors are redirected back to your campaign site, Stripe's confirmation page gives donors the option to share your campaign on social right after they complete their donation. For a deeper look into how each donation processor works, view our support articles Donation Processing With PayPal and Donation Processing With Stripe. In regards to setup, the potential advantage of choosing PayPal is that your organization likely already has a verified PayPal account, and to link it to CauseVox only requires copying and pasting the email address associated with the account. However, it's less common for organizations to have previously used Stripe, you most likely will have to set up a Stripe account and make sure it's verified. 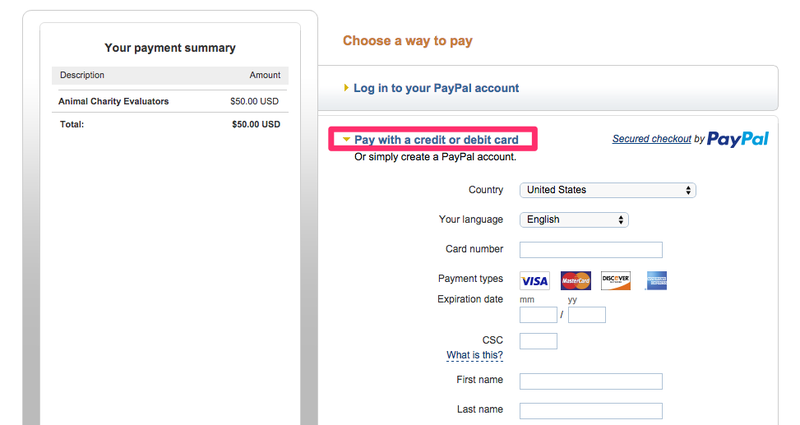 For more information on how to set up a Stripe or PayPal account, view our article How To Set Up Donation Processing. Regarding PayPal's and Stripe's donation processing fees, for business or personal use the standard transaction fee on both platforms is 2.9% + $0.30 per transaction. However, regarding the the pricing for nonprofits, there is some differences. You can apply for nonprofit pricing for PayPal here. 2.2% + $0.30 per donation for non-American Express and 3.5% flat for American Express cards. Additionally, Stripe and Paypal differ in the way they transfer funds into the bank account. 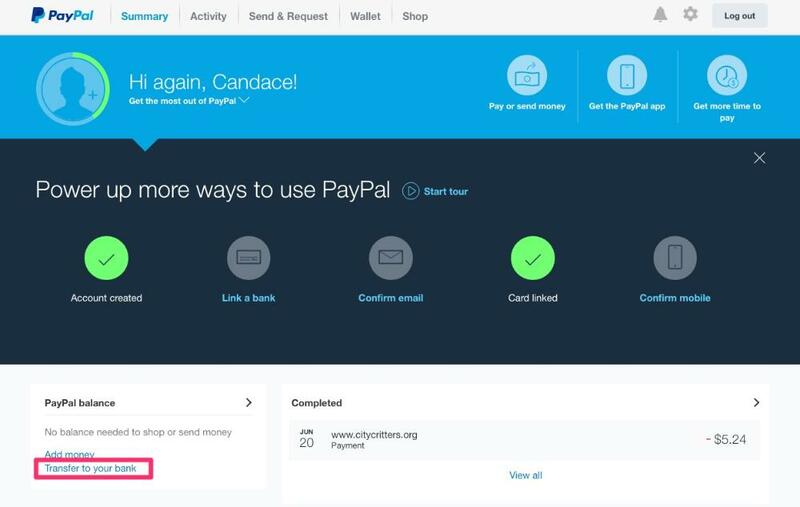 With PayPal, you can login to your PayPal account at anytime during the campaign to request funds be transferred into your bank account. After the request is made, it typically takes 3-5 business days to complete the transfer. With Stripe, you choose how often you'd like deposits automatically made from your Stripe account into your bank account, as frequent as on a 2 day rolling basis. Ultimately, your decision on which donation processor you'd like to use for your CauseVox campaign depends on which types of features you value most. You can always contact Stripe or PayPal for additional questions regarding the donation processors.